Today is a very relax day for us, we woke up late at around 9am and spend half of the day chit chat-ing over breakfast until close to noon time. After breakfast, we walked to a nearby family mart to get some food to bring home. After that, we went back the hotel and showered. Finally, we are out of the hotel by 1.30pm. Initially our plan is to visit the palace but it seems a bit late now and we wanted to go Ben Thanh market again plus we have a reservation at the Sky Bar this evening so we decided to skip the palace. So, we decided to just snap a shot of the palace from the cab since we won't be visiting it! We went to Ben Thanh Market and I bought a hat and a cap for my boy, a paper chinese style fan for my girl and G bought more dresses and some painting for her house. Some nice painting at Ben Thanh. We kinda run out of cash so we pop by a money exchange to get more Vietnam Dong. We walked around the Malaysian Halal Street which houses many halal restaurant. For a very late lunch, we decided to go for Hokkaido Sachi, the food here is of good quality. Most of the things we ordered are very yummy. We spend VND 350k each for sushi roll and desserts. After lunch, we went back to hotel to change and we headed to EON51 Heli Bar. 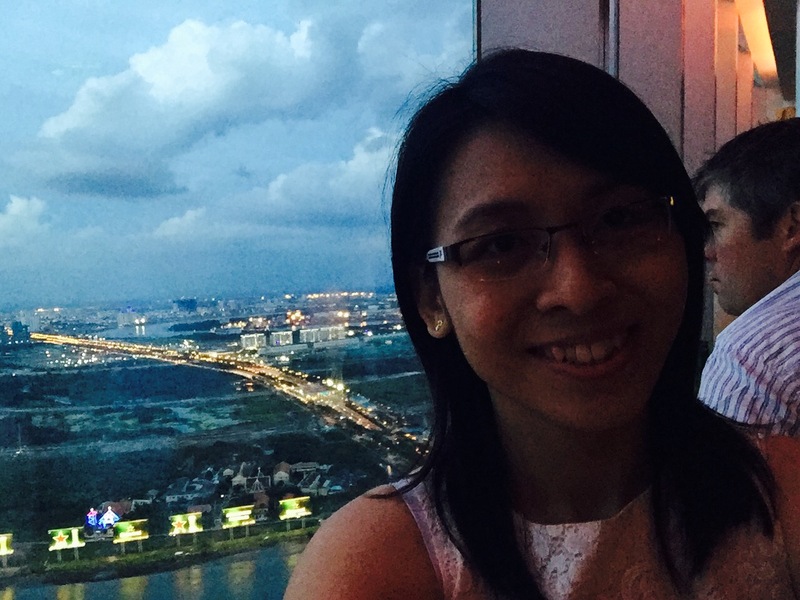 * If you wanted a view of Saigon city, I would suggest either the Heli Bar or the restaurant instead of the Sky Deck. Ticket to Sky Deck aren't cheap and you don't get any food or drink. Instead, pop by the restaurant for business lunch or sky bar for a drink, it is definitely more worth it. Best of all, there is no dress code for the bar, so you can just pop by in your casual comfortable clothing. Just a wefie but we will be heading to the sky bar instead! Located at the Bitexco Financial building, the view from the sky bar is amazing! We make reservation beforehand to secure the window seat. We reached at about 6.15pm so that we can enjoy the daytime--> sunset--> night view and it is totally worth it! This is the prices for Happy Hour (from 1pm to 4pm). VND 79 for a beer and a bowl of nuts! Very worth it! Buildings start to light up as the sun sets..
We each ordered a cocktail which cost about USD $12 each. Love the view! So amazing! Bought a couple of items from both Mango and Warehouse (very very good promotion). By 10pm, we are done with shopping and we wanted to make our way back. Unfortunately, it was raining cats and dogs. So we settle for Hog's Breath cafe which is located on the ground level of the building. The steak is as good as the one I ate in Perth but it is kinda pricey for vietnam standard. 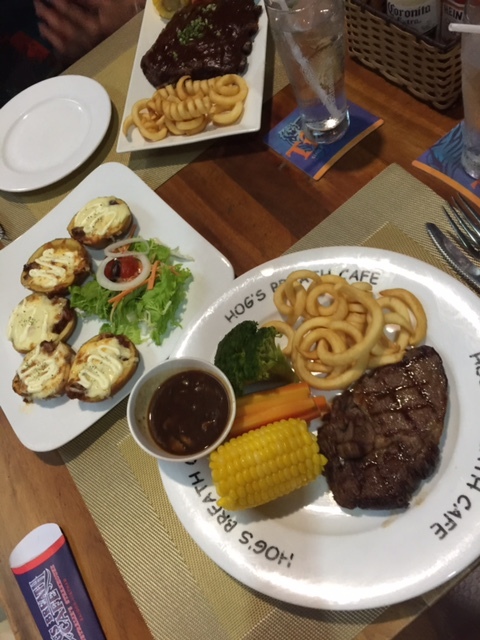 Steak alone cost SGD$30. We reach hotel at 11pm and both of us was very tired so we showered and pack and slept.